As far as we’ve been able to find out, Chappel’s Corner wasn’t actually very close to Wellington College at all. It seems to be where the St Sebastian’s Memorial Hall is now. 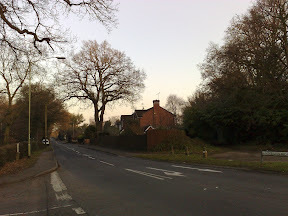 I understood that Chappels corner was at the top of the New Wokingham Road opposite St Seb’s Memorial Hall. This looks to me to be on the corner of Waterloo Road/Dukes Ride.